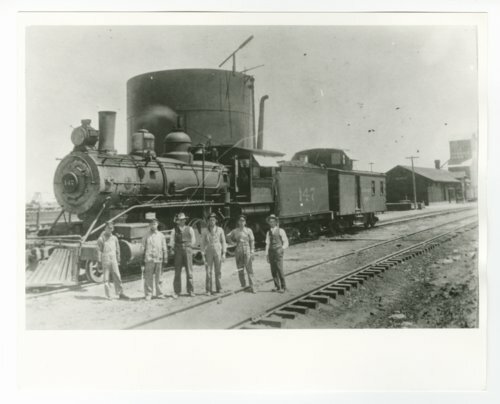 This photograph shows a group of men standing in front of the Atchison, Topeka & Santa Fe Railway Company's steam locomotive #147 possibly in Fairmont, Oklahoma. The locomotive was built by the Baldwin Locomotive Works of Philadelphia, Pennsylvania with a wheel arrangement of 2-6-0, and operated along the Denver, Enid & Gulf Railroad line. It was scrapped for metal in 1927.